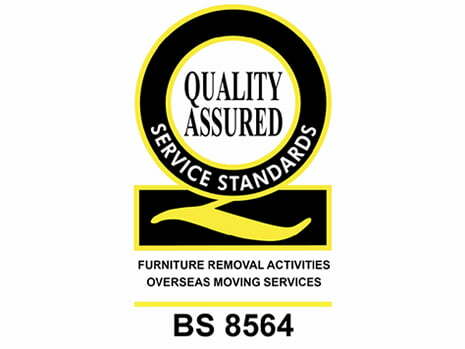 Matthew James Removals is pleased to announce that we are now BS8564 accredited – “The Overseas Moving Standard”. BS 8564, the Overseas Moving quality standard, is closely related to BS EN 12522, the original “domestic removals” standard and also shares some elements with BS8522 (commercial moving) and BS EN 14873, the “storage standard”. These standards have been created in order to provide the moving industry with recognised, specific and measurable benchmarks which are relevant to its particular activities, unlike more generic quality standards such as ISO 9001. Because of the synergies with other standards, companies who are already certified to ISO 9001 or BS EN 12522 should find it relatively straightforward to incorporate the requirements of BS 8564 into their existing quality management system. Some elements are mandatory, i.e. the standard says that certain measures “shall” be carried out and sometimes the exact process and required output are specified. Prior to assessment it is most important to ensure that all such requirements are being met as any shortcoming against those clauses will result in “nonconformities” which will delay certification. It is QSS policy that nonconformities must be remedied by the end of the month following audit, before certification can be granted. In other areas the standard is less rigid, merely giving recommendations for best practice. When assessing a company’s performance against those, an auditor can show greater flexibility and may report only “suggestions for improvement” rather than nonconformities. Either way, all the audit findings will be followed up during the next year’s visit to ensure that corrective action has been taken and that it is effective. Throughout, the standard has been written by movers for movers and there should not be anything that will cause major difficulty for any well-run moving company. On the contrary, virtually every company that has undertaken any of the removals standards to date has said that it was not as difficult as expected. BS 8564 covers the three phases of a removal: firstly the initial contact, survey and quotation; then the carrying out phase; and lastly the follow-up including quality measurement and the handling of any claims or complaints. In developing the standard, input was gathered from clients and various industry bodies all of whom made an invaluable contribution to the work of the development committee. Their involvement ensured that the standard would be valued and meaningful in the marketplace; as with BS 8522 the commercial moving standard, over time it should become a regular requirement for major tenders in both the public and private sectors.